Accept every form of payment. Xola’s POS integrations includes credit card swiper, cash drawer, receipt printer, allowing you to easily accept and process any payment method used for online, phone, in-person, and reseller reservations. Delight guests with beautiful, keepsake tickets printed on-site. Xola’s ticket designs are fully customizable, allowing you to easily showcase your brand, specific location, special events, and anything else you'd like to highlight to guests. The walk-up guest experience starts once they walk through your doors. Equip reservationists with the most intuitive software so they can fully focus on the guests. And Xola’s self-serve booking kiosks and lobby TV displays keep the line moving quickly. Accept any and all payments. Give your guests the freedom to pay however they choose. Accept cash, credit, check, gifts, vouchers, and custom payment methods. With Xola’s POS integration you can easily swipe credit cards, scan QR codes, automatically print receipts once the transaction is complete, and use an integrated cash drawer. Create or modify call-in bookings in 3 clicks or less. 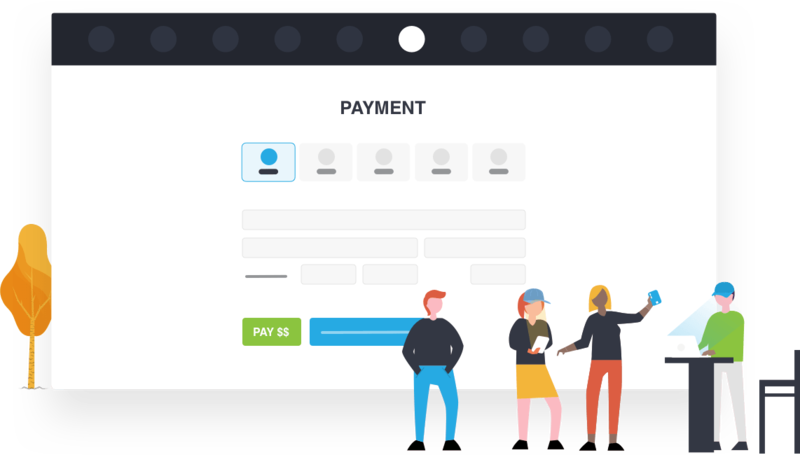 Easily book and charge customers over the phone, or decide to charge a deposit, issue an invoice, or collect payment in full on-site. Xola’s award-winning online booking software provides the quickest and easiest workflows for staff and guests alike. Delight guests with beautiful, keepsake tickets that keep the line moving. Create lasting memories with beautiful tickets printed on-site. 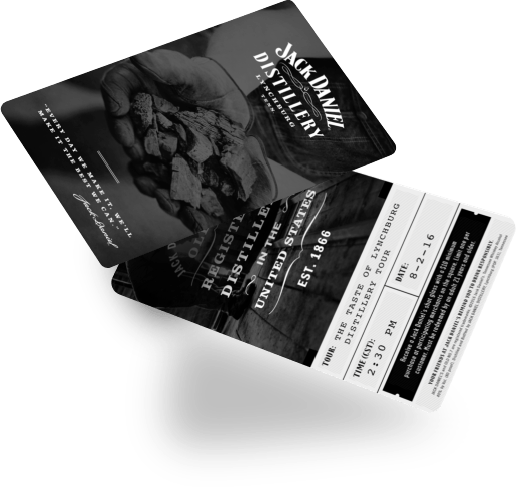 Design and print branded, keepsake tickets that delight guests. Easily adapt the ticket design to specific location, special events, promotions, or anything else. Seamlessly print tickets upon check-in. With Xola, tickets are automatically printed once guests check-in and provide you with an easy way to keep track of guest information as they go through your experience. Delight guests the second they step through your doors. Streamline front-desk operations, minimize waiting time, and improve the guest experience with Xola’s self-serve kiosks. Guests can easily check-in or book and pay for an experience on-site using one a self-serve kiosk. Bookings made using the kiosks appear within Xola and can be managed easily by staff, just like any other reservation. Display upcoming tour information to on-site guests with Xola's TV Display. Easily customize the information displayed to guests add your branding and look and feel. 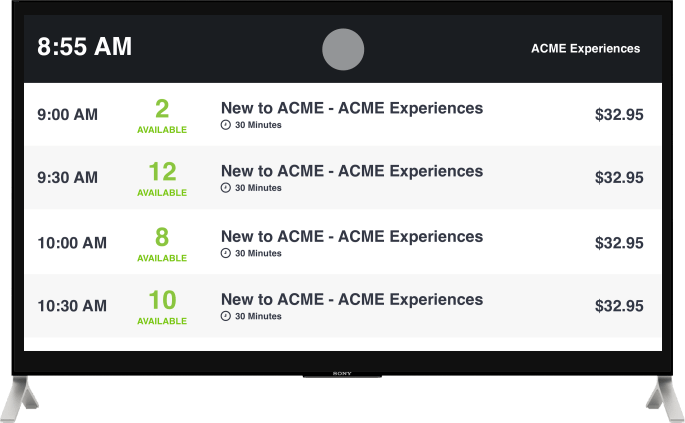 Tailor the Xola TV information display to your audience, experiences, and needs in minutes.